I have long been a Roy Grace fan so was thrilled to read another one of the books in this series. Compulsively readable, this book was as good as the others with a fast-paced murder mystery that kept me guessing. Roy Grace is a lovable character who is unparalleled when it comes to solving crimes, no matter how difficult they may be. This story being no exception, touching such topics as murder, infidelity and abuse until it all comes to the final denouement. The regular supporting characters like Roy Grace's boss, Cassian Pewe, and Cleo making reappearances and the introduction of new characters like Roy's son, Bruno, every detail has been well thought out and executed in the continuing saga of the detective's life. 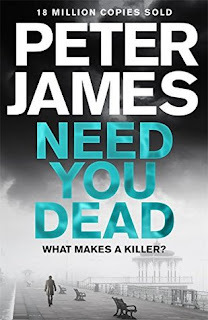 Peter James is somewhat of a genius in this genre and I wish I knew what his secret was in creating such gripping tales!